A B.C. gold rush tale has earned a platinum award at WorldFest, the Houston International Film Festival. Canyon War: the untold story took the top prize in the festival’s Television and Cable Productions Cultural category last week in Houston. 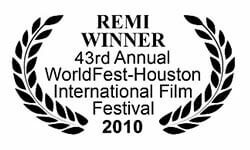 The “Remi” award is the second major prize won by the documentary, which took honours at the New York International Independent Film and Video Festival (NYIIFVF) for Best International Director of a Documentary last month. WorldFest is one of the oldest Independent film and video festival in the world and has helped to launch the careers of such famous directors as Steven Spielberg, George Lucas, Spike Lee, Oliver Stone and David Lynch. The documentary is vividly brought to life by co-hosts Kevin Loring (a Governor General Award-winning playwright and actor from the Lytton First Nation) and Dr. Dan Marshall of the University of Victoria. Loring’s ancestors resisted the thirty to forty thousand gold seekers who flooded into the Fraser River in 1858 while Marshall’s forebears were among the gold-seekers. “With these two significant film festival awards, the Canyon War Team has taken a major step forward in its pursuit of assisting First Nations reconciliation and our continued commitment to provide new and more inclusive stories for the television-viewing public,” said Marshall. The documentary about the First Nations-miner conflict in the Fraser Canyon during the 1858 gold rush beat out a large field to win the Remi, said J. Hunter Todd, WorldFest Chairman and Founding Director, and Kathleen Haney, Program and Artistic Director in a personal note to Wunderman and the rest of the Canyon War documentary cast and crew. “Personal congratulations for your Platinum Remi Award Winning entry, Canyon War: The Untold Story,” said Todd and Haney. “We are delighted to say that your Award assumes a very special significance this year, as more than 4,400 category entries were competing from 33 countries. Canyon War made its regional television debut on Knowledge in January and will be broadcast nation-wide o n Canadian TV later this spring on APTN. It repeats on Knowledge Friday May 21, 7:00 p.m. Sunday May 23, 10:00 p.m. and Monday May 24, 11:00 p.m. The documentary was shot on location in the Fraser Canyon in 2008 — 150 Years after the war it depicts took place. It was made possible by a partnership between the Ministry of Aboriginal Relations and Reconciliation, Heritage Canada, CN and BC150 working in association with the New Pathways to Gold Society. The NPTGS is a community-based organization dedicated to continued reconciliation with First Nations, investment in B.C. heritage and economic development.